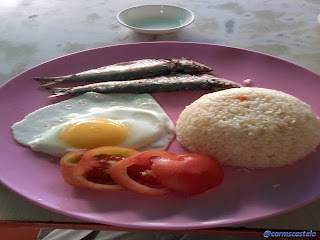 Everywhere in the country, you see a lot of “silog”. Tapsilog. Tuyosilog. Hotsilog. Longsilog. Tocilog. Whatever the combination is, these silog’s come as Filipino foods. Silog. More Fun in the Philippines. Silog stands for sinangag and itlog. Sinangag means fried rice. Itlog means egg. Combinations include tapa, hotdog, longganisa, tocino, tuyo. How do I English these? Anyone? Tuyo is fried dried fish. Hotdog, longganisa, tocino, tapa – processed foods, etcetera. I like it eating tuyosilog. I match it with sukang maanghang (spicy vinegar). Tuyo may be salty and not so friendly to people avoiding too much salt. However, the moment I taste tuyo, I have to eat more rice, (carbo). To me, eating silog which is only in the Philippines is a gluttonous patriotism. Silog. I patronize it. It is more fun eating silog in the Philippines…and it is gluttonous to me.